Ian William Dickson was born in Maxwelltown (a separate burgh from Dumfries until 1928) in September 1902. A teenager of prodigious talent at Queen of the South, he played in the first ever game in Queen's history. Dickson went on to play for two clubs in England’s top division. Aged 20 he top scored at Aston Villa in a season when he was selected for the Scotland international trial prior to the game v England. Dickson also scored goals for Middlesbrough before injury curtailed his senior playing career aged 23. As Scotland tried to recover and step away from the nightmares of World War I, Ian Dickson and Dave Halliday both played in the trial games that were arranged when the recently formed Queen of the South F.C. were looking for players in the Summer of 1919. 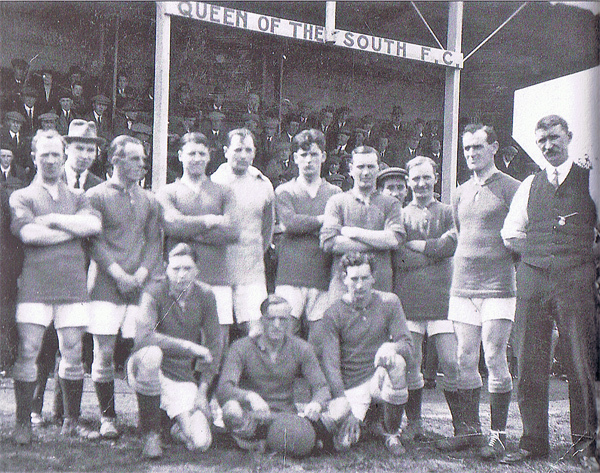 After the four trial matches the first ever game in Queen of the South history took place on 16th August 1919. To help add credibility to the idea of a genuine landmark event taking place, invites were sent to the likes of leading politicians and legal dignitaries from both Dumfries and Maxwelltown. Pre match entertainment was provided by Dumfries Town Band belting out their finest songs at their best. The game against Sanquhar side Nithsdale Wanderers saw Queens twice come from behind to earn a 2 – 2 draw. Among the players of Queens’ first ever game was Ian Dickson a couple of weeks before his 17th birthday. Dave Halliday joined Dickson at Queens in January 1920. The two forwards and the rest of the first season’s squad rounded off the season well; they lifted the club’s first ever trophy - the Dumfries Charity Cup. Queens second season, 1920-21, continued in a similar vein to the first season with a combination of challenge games and minor cup ties. The Potts Cup, the Southern Counties Challenge Cup and the Charity Cup all ended up at Palmerston Park. The Scottish Qualifying Cup saw Queens make the semis. In the Qualifying Cup first round Creetown Volunteers were thumped 9-0. Whithorn were them similarly destroyed on the end of a 12-1 defeat (Dickson hit four). Six were then rifled past Mid-Annandale by Queens and then five against Solway Star, both without reply. A 0-0 draw against Johnstone came before a 1-0 Queens replay victory. Queens cup run then ended with semi final defeat to East Fife. In the Challenge Cup final at Showfield Park in Thornhill, the sleety conditions must have had attendees convinced Snowfield Park would be more apt. Dickson’s 23rd minute strike opened the scoring. Gray of Queens knocked the Nithsdale Wanderers goalie off his feet in the second half. Half a dozen or so unruly fans of the Sanquhar club invaded the pitch shamelessly brandishing flags and sticks. A shout of ’come on’ to other fans was mercifully disregarded. Police intervened to remove the fans from the pitch. Unsporting tactics from Wanderers and a disputed penalty followed. Then the un-diplomatic Gray once more knocked the goalkeeper over sparking further crowd disruption. Despite Wanderers pressure Dickson’s goal proved to be the winner. In the Potts Cup, Queens seen off Stranraer 3-0 before a 2-1 replay victory in the final against Nithsdale Wanderers (the initial game was 2-2). After the Charity Cup final Nithsdale Wanderers must by now have been sick of the sight of the Queens side. A 3-1 Doonhamers victory brought the season to an end. In a veritable vortex of transfer activity Ian Dickson was transferred from Queens in January 1921 to Aston Villa. He was 18 at the time. All three of Jimmy McKinnell from Dalbeattie, Willie McCall and Tom Wylie were sold to Blackburn Rovers around the same time. This combined with Dickson’s move to Villa helped fund Queens’ purchase of Palmerston Park in 1921 for £1,500. The departure of a player of Ian Dickson’s undoubted calibre from such a fledgling outfit could be looked back upon as a player who would take a lot of replacing. However Dickson’s name on the Queens team sheet was replaced by that of a certain Hughie Gallacher. These two and Halliday were the three strikers to play in Queens very first two seasons before moving on to successful careers in England’s top division. In that first season at Aston Villa, Dickson scored two goals from his eight appearances playing at inside-right. At this stage Villa were trying to find a new centre-forward as Billy Walker (Villa's 244 goal all time highest marksman), proved to be a better inside-left than a centre-forward. The club finished 10th of 22 English top flight clubs. It was the 1921/22 season that Villa Park seen the best of Ian Dickson. Playing centre-forward he scored 20 times in 36 league games and 8 in 6 FA Cup games for a seasonal total 28 goals from his 42 appearances. In the era of the three man offside rule this was a very commendable strike rate playing at that level. This made Dickson Villa’s top scorer that season one goal ahead of Walker. 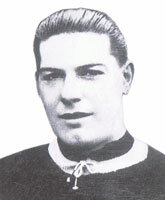 It also made Dickson the first ex-QoS player to top score at a club playing in England's highest division (Hughie Gallacher went on to achieve that feat 11 times at Newcastle, Chelsea and Derby; Dave Halliday did so five times at Sunderland and Manchester City. Halliday was also outright highest scorer in the entire division in 1928/29). The improved fifth place league finish compared to 10th the season before could still be considered a disappointment depending how you wish to look at it. Early season Villa were top after seven games. After an April fools day defeat of Blackburn, Villa were second. However a disappointing run-in from then produced five defeats and only two wins from the last seven games. In the FA Cup they knocked out Derby (home 6-1), Luton (home 1-0) and Stoke (4-0 in a home replay after 0-0 away in the first game). Then after drawing 2-2 away to Notts County in the quarter-finals, Villa lost the home replay 4-3. John Litster at the Scottish Football Museum has confirmed 20 year old Dickson was selected for the 1922 Scotland international trial match for the England v Scotland game. The trial took place on the 22 March 1922 at Cathkin Park in Glasgow before 16,000 spectators. The game ended a 1-1 draw between the Home Scots against the Anglo-Scots side with Dickson of course playing for the Anglos as an Aston Villa player. Ultimately he was not chosen to play in the subsequent trip to play England in April at a ground very familiar to Dickson, Villa Park. The selectors stuck with the incumbent centre-forward, the extra-ordinary Andy Wilson. Wilson's senior football debut was with Middlesbrough on 2 January 1915 where he initially scored five goals in nine games. Like many others his playing career was interrupted by World War 1. He served in combat in which he suffered serious injury to his left hand and forearm from enemy fire at Arras. He played for Hearts over a year and a half in 1918 and 1919 also guesting twice for the soon to be defunct Leeds City (leading to the formation of Leeds United in 1919, the same year as QoS). In Spring 1919 Wilson scored four goals in two unofficial internationals. Wilson then joined Dunfermline Athletic and became their first ever full internationalist. He impressively scored six goals in six full Scotland appearances in two seasons when with the East End Park club. Wilson returned to Middlesbrough in time for the start of the 1921/22 season that he ended as England's top flight highest scorer with 31 strikes. He further justified the Scotland selectors continuing faith in him. He improved on the goal per game international average he already had by scoring seven goals in the remaining six full Scotland internationals for which he was picked (all when at Boro). That included the only goal of the game against England at Villa Park for which Dickson had been in the preceding trial match. Wilson's final international tally was 13 goals from 12 full Scotland caps (17 from 15 if including three non-full cap games he played in). This is a great testament to the multi-talented Wilson who played with a glove over his damaged left hand. He is also reported to have been an England lawn bowls internationalist, made century snooker breaks and had a single digit golf handicap. While Wilson prevented Dickson and other Scots centre-forwards at this time from the opportunity of international honours, Wilson was to inadvertently affect Dickson’s later career. The season after Villa finished one place lower in a still creditable sixth. Dickson scored 7 goals in 30 league games and played in one FA Cup tie without scoring. Champions in both of these two seasons were Liverpool. In his four games playing centre-forward against Boro, Dickson averaged a goal per game. Villa cracked in 16 strikes in those four matches. In the two games in his time at Villa when he didn’t make the 11 to play Boro, Villa failed to score and on one occasion lost 5-0. Football history is full of teams who sign players who have performed well against them. If nothing else it stops such a player playing and scoring against you (other than the possibility of an own goal). An obvious recent example was QoS signing Colin McMenamin. And so it was with Dickson. He left part way through 1923/24 lured by a prospect of regular first team football. On 17 November 1923 Scotland internationalist Andy Wilson scored in a 2-0 home league win for Middlesbrough v Chelsea. After the return game seven days later (a 2-0 home win this time for the West London team), Wilson transferred from Middlesbrough to join another ex-QoS player in Willie Ferguson among David Calderhead's Scots contingent at Chelsea. The world record transfer fee up until this point was the £5,500 Sunderland paid in 1922 for Warney Cresswell from South Shields. Thus the £6,500 Wilson transfer from Boro to Chelsea appears to have been a world record fee at the time. £3,000 received from Wilson's transfer funded Ian Dickson leaving Aston Villa; a very significant sum of money at the time especially for a relative youngster of 21. He joined top division Middlesbrough on 19 December 1923 with Boro at the time increasingly in a relegation battle. This shattered the previous record fee paid by Boro for Love Jones 15 years previously. Dickson debuted alongside William Wainscoat in a 2-1 home defeat to Preston on 22 December. They played Burnley home and away on December 25 & 26. The first game was 0-0 in Burnley. In the return fixture at home Dickson scored all of his side's three goals with none reciprocated by the visiting club. Dickson's signature looked like good business. Yet that game versus Burnley was to be the highlight for Dickson on Teesside. The win v Burnley was Boro's first win in seven games and was not the beginning of a revival. Dickson only added two further goals for a final tally in his first half season at Ayresome Park of five strikes. Dickson was second top scorer behind Wilson who ended the season as top scorer at both Boro and Chelsea. In moving from Boro to Chelsea Wilson swapped one relegation battle for another. Ironically he top scored at two clubs that season both of whom were relegated that same season from England's top flight. He never played for Scotland again after leaving Middlesbrough. George Elliott started the following season as the preferred Boro centre-forward with Dickson left out of the side. 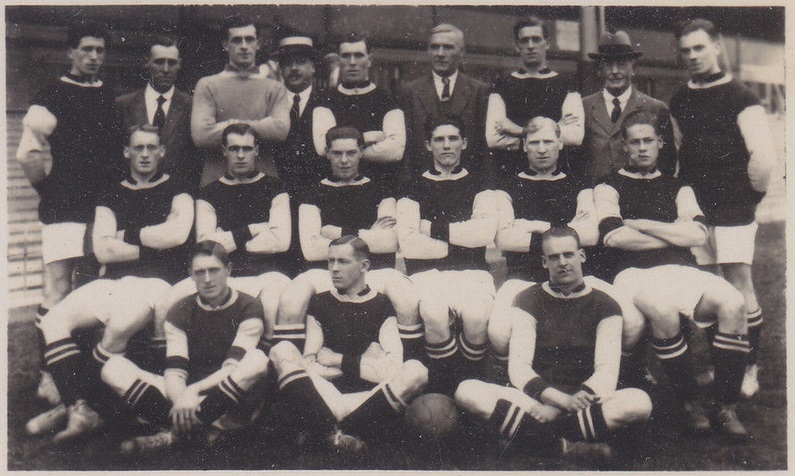 Dickson was recalled for the second part of that 1924/25 season finishing joint club top scorer along with left winger, Owen Williams. Both scored seven goals. Boro were sufficiently impressed with Jimmy McClelland's 16 goals in 23 games for Southend United that season to sign him in March 1925. This was to be Dickson's last season of competitive first team football at Boro. In 1925/26 Dickson didn't feature in the first team, troubled for the season by a leg injury. McClelland took his chance in the first team well to top score with with 38 goals. An opportunity appeared on the fifth game of the 1926/27 season when McClelland was injured. Dickson was no longer at the club to stake a claim as he had been released on a free on 1 May (1926). The chance in the first team was given to George Camsell. Camsell took his opportunity in astonishing style scoring a barely believable 59 league goals that season. Despite this being overshadowed by Bill 'Dixie' Dean's record 60 goal haul that same season for Everton, Camsell top scored for Boro 10 seasons in a row. Scoring a stunning 18 times in his only nine full England games, he could consider himself unfortunate not to be awarded more international caps. "Unfortunately I have no more information where he [Dickson] went afterwards. However in the book ‘Football League Players Records 1888-1939’ by Michael Joyce it mentions a side called Wesbrough after us, but no dates. I can’t find a side or place spelled like that but there is a Westborough in Lincolnshire. Sorry I can’t be of more help." "As for Andy Wilson it is confirmed in the Boro ledgers of the time that he did indeed sign for Chelsea in 1923 for £6,500. What seems to have gone under the radar is that it does indeed look to be a world record transfer, but again this was news to me." So it seems after his lengthy injury issues at Boro, Dickson dropped out of senior football at the age of only 23. A disappointing end to a professional football career that showed so much potential as a 19 year old, scoring 28 goals in a season in which his Aston Villa side finished fifth best in England. He performed well in his year and a half or so at newly hatched Queens to earn the move to play at that lofty level. Ian Dickson will always be a connection to that very first ever Queen of the South F.C. game in August 1919. He died in 1976. Since the above article was first published we have identified that Ian Dickson’s grandson, also called Ian Dickson, is today massively successful in the entertainment industry. The following is extracted from an article that was first published on a previous version of qosfc.com in 2008. Ian Dickson is a massively successful music industry mogul who has worked with performers such as Def Jam, Public Enemy, LL Cool J, Ozzy Osbourne, Living Colour, Celine Dion, Gloria Estefan, Rage Against The Machine, Pearl Jam, Jamiroquai, Des’ree, Reef, Manic Street Preachers, Natalie Imbruglia, Five, Westlife, The Eurythmics, M People, Avril Lavigne, Pink, Alicia Keys, The Foo Fighters and many others. After emigrating in 2001 to Australia he has become a TV and radio personality in his own right after being invited to be one of the judges on Australian Idol, the Aussie franchise of Pop Idol. From being the ‘pantomime villain’ judge on Australian Idol, he has since been a judge in the states on ‘The Next Great American band’. In Aus, Dickson is now on countless mainstream TV and radio programs. However his grandfather, also called Ian Dickson, is a Queens Legend. Hailing from Dumfries, after starting off playing with Queen of the South at the very beginning of the club’s history he headed South to score goals in England’s top division with Aston Villa. Dicko is the son of two factory workers from the motor industry. "Imagine Detroit with heavy metal instead of Motown and you’ve got Birmingham,” explained Dicko for Australian Idol. Dicko the TV presenter is crazy about soccer (as the Aussies call it), but he still insists on calling it ’football’. He plays for Kissing Point over 35s team in the amateur league on Sydney’s North Shore. Dickson’s views on Ted McMinn in his spell at Birmingham City do not appear to be documented.